The thought of leaving warm covers of your bed on a cold winter morning isn’t very appealing. Even worse is the idea of leaving a hot shower to step on a cold tile floor. How can you warm up your bath when the temps are low? Bob Vila has some great ideas! Place a few soft but thick rugs in front of the shower, sink and toilet. Ahhh! Let your eyes deceive you. 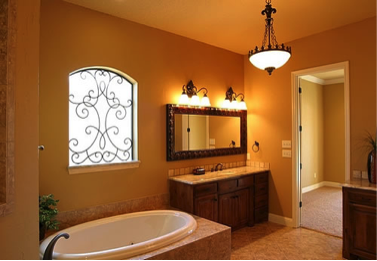 Decorate your bath with warm colors. Red, orange and yellow tones will give the room a warmer feel. Check your windows. Are they letting in cold air drafts? Test by holding up a tissue or square of toilet paper at the window frame. If it moves, you have an air leak. You can help stop the leak by caulking around the window. Windows—the ones that don’t leak air—can bring a source of warmth. Let the sun shine in. Pull back curtains and raise blinds if you have them. If you’re concerned about privacy, apply a translucent film to the bottom half of the window. If your towel gives you the cold shoulder, hang it over the shower door or curtain rod so you don’t have to reach out to get it. Just be sure to get it out of the way so it doesn’t get soaked while you’re enjoying the hot water. If you wince at the thought of leaving the warm, humid bath to go to a cold closet to get your clothes, hang the clothes on the back of the bathroom door. This will also help to steam out any wrinkles for a more professional look at the office. For an even warmer towel, invest in a heated towel warmer. This device will heat up your towel while you are showering. Heat things up. A heat lamp might be old school, but it’s a way of warming up a cold room. Using this lamp will heat up only the bathroom and not your entire house. Talk about energy efficient. If you have a radiator that doesn’t warm up completely, chances are it needs bleeding. This lets trapped air out of the system, allowing hot water to fully warm up the radiator. To do this, turn the radiator’s bleed valve counter-clockwise slightly with a radiator key or flat screwdriver until you hear a hissing sound. Once water begins exiting the valve, turn the key clockwise to close it. Floor it! If all of these ideas don’t heat up the bathroom as much as you would like, consider adding radiant floor heating. Electric heating coils or water-heated tubing are added underneath your floors, creating warmth that rises from the floors upward to heat the room naturally.